We are thrilled to report that one of our WG6 students has been successfully elected to represent Dartford on The Kent Youth County Council. Jonathan B is an excellent role model and a fine ambassador for the school. With a great interest in Politics (he even enjoys teaching his fellow students in his A Level lessons) and a passion to pursue a career at Westminster, we await with anticipation his calling into mainstream politics, where he can be assured of a great following from his peers in Wilmington. Our GCSE Celebration afternoon provided an opportunity to reflect upon the achievements and ambitions of our last year’s Y11 cohort. Students were presented their certificates by our special keynote speaker Natalie Price who attended WGSG. She has recently completed a Masters in Global Health and Social Justice and now works for Comic Relief. Natalie was able to bring her own ideas and wisdom on how careers can develop and how opportunities in life need to be taken wherever and whenever they present themselves. Prizes and subject certificates were also awarded. Thank you so much to our Sponsors for their continued support of our students. Guests included parents and family, Sponsors and The Mayor and Mayoress of Dartford. It has been good to see so many of our Year 12 students make a strong start to their time in WG6 and we look forward to seeing them achieve great things not only in their academic studies but also in their skills of leadership, community service and social awareness. Musical interludes were provided by Y7 students singing the school song and The Gospel Choir, who both gave beautiful performances. 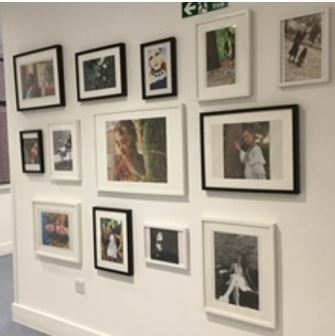 The Art Department have installed a new photo wall in the Connell Wing featuring Y9 narrative photos. The students worked in teams to picture scenes from Romeo and Juliet or Alice in Wonderland. They dressed up, made costumes and props and did make up for their photos shoots. They used the grounds and school buildings for the setting, although some took more photos out of school too. They went on to edit their photos. More photos will go up shortly in other areas around school. Y10 Focus lesson centred on the relationship between stress and mental health and to explore ways to positively manage stress. These session were for Y10 students with a view to creating good habits and working practices as they continue through their GCSE studies. Students explored methods and tactics to manage external pressure and to develop resilience via lifestyle, physical health and by simply being kind to yourself. Year 9 Focus lesson learned about the Criminal Justice System and the different types of Courts. Students conducted a group investigation into knife crime, evaluating a sample crime to discuss and debate the circumstances of the crime and the suspects. Students then assessed the evidence to decide whether there was enough to show there would be a ‘realistic chance of conviction’.